His dad is named Bill, played football/baseball at Catawba. Not really seeing that “big gap” when the two teams on the field. The stars and recruiting hype are nice but this going to take some time, especially a 4th year team trying to establish pipelines. were all those offers committable? 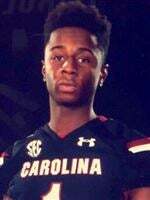 Cameron Bent is a 6-0, 180-pound Wide Receiver from Bluffton, SC. He has 1 Offer. Impressive offer list for Bent, South Carolina, Coastal, and ODU. Looks like a game changer with that lightning speed! I wonder if he knows how to fair catch a punt??? clt says ur recruiting is picking up tremendously. Building that so needed depth. Hope we can finish strong with several more top recruits on both sides of the ball. I know we need help at DB for some depth. You’re right. We really need to lock down Aapri Washington. Whats up with Cameron Bent listed as a soft commit on 247 and retweeting all this Georgia State stuff?! We better not lose him to them! He has serious speed and is a 3 star Wide Out who could play as a true freshman for us. We cant let him get away. Looks like a family member or friend is playing there. His twitter still shows Charlotte. 2 more months of this. Does anyone know who or what positions we are still recruiting? I know this is suppose to be a big class, but I think 25 is the limit. I have not seen a RB yet and we usually always have at least one with the injuries every year. We do have a running back commit. He’s from Ocala, Florida and has good offers. My bad. I forget about him.